Posted on Thu, Oct 27, 2011 : 2:43 p.m. The Michigan football team has a weakness. Purdue has a strength. The Boilermakers' strength can exploit the Wolverines' weakness. In other words, it's not hard for Michigan coach Brady Hoke to project what Purdue will try to do when the teams meet at noon Saturday on ESPN2. 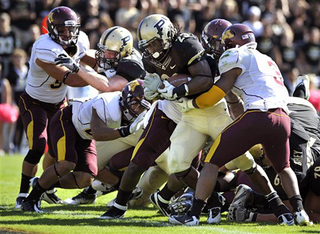 Purdue relies on its running game and Ralph Bolden, shown scoring against Minnesota, leads the Boilermakers with 398 rushing yards. Michigan's defense has improved remarkably this year, but its biggest weakness in recent weeks has been its incapacity to contain outside runs. Northwestern exploited the perimeter for a half two games ago, then the Wolverines seemingly clamped down on the problem. But Michigan State showed that fix was only temporary when it handed the 17th-ranked Wolverines (6-1, 2-1) their only loss of the year. The Spartans rushed for 213 yards against Michigan, with much of that coming on runs that tailback Edwin Baker bounced outside. The Wolverines did not hold containment well, nor did they adjust. Defensive coordinator Greg Mattison said the biggest reason the Wolverines are struggling on the perimeter is defenders are not fighting off blocks by receivers. "We’ve got to be a lot more physical on blocks," he said. "It has got to be the mind-set, when a wide receiver tries to block you, that’s an insult. "There have been too many times where we're just kind of caught on it and pull off it, rather than attacking it and going through it." Fighting through blocks has been an issue across the defense. Senior defensive tackle Mike Martin said that, along with tackling, has been the biggest point of emphasis the past two weeks. "Coach, if he catches a guy not running through (a block), he’ll rip him," Martin said. The linebackers also shoulder some of the blame for the leaky run defense. They have struggled with hesitancy issues, and also have taken some bad routes to ball carriers. What do the linebackers need to work on to shore up this problem? Purdue is running the ball well. It is ranked 27th nationally in rushing offense (195.1 yards per game) and fourth in the Big Ten, just behind Michigan. A lot of that production has come on runs outside the tackles. How much do the Boilermakers rely on the run? They are 9-1 under coach Danny Hope when rushing for more than 200 yards (which Michigan has allowed its past two games). They are 4-17 when they don't. Hoke said Purdue's offense is comparable to what Michigan State runs. Running backs Ralph Bolden (398 yards) and Akeem Shavers (325) lead with way for Purdue, and speedy Akeem Hunt (141) also will get time. Starting quarterback Caleb TerBush (142 yards) also rushes a little bit. Purdue also deploys some Wildcat sets with receiver Justin Siller at quarterback. They could use those formations to stretch the Michigan defense and attack the perimeter. Martin is familiar with Siller, as they both played high school football in the Detroit area. Siller was a full-time quarterback then. Martin remembers two things well about him: First, Siller is really fast. Second, how good it felt to blast him for a 9-yard sack on a big-time hit. "You never forget those, man," Martin said. "I still got pictures on my Facebook, I think." Fri, Oct 28, 2011 : 3:59 p.m.
Fri, Oct 28, 2011 : 10:51 a.m.
Fri, Oct 28, 2011 : 10:29 a.m. Anyone at MSU including the water boy can tell him how to beat UofM. Thu, Oct 27, 2011 : 10 p.m.
Thu, Oct 27, 2011 : 9:04 p.m.
Michigan seems ready to shore up this perimeter weakenss. I'd be shocked if they don't and the same thing happens against Purdue as it did against MSU. I am optimistic that Michigan will correct a lot of issues. They probably won't be perfect, but much better and secure the win. Go Blue!! Thu, Oct 27, 2011 : 8:43 p.m.
Every game Michigan loses falls on the coaches. Thu, Oct 27, 2011 : 8:41 p.m.
Thu, Oct 27, 2011 : 7:57 p.m.
Purdue's offensive and defensive lines are no bigger than our own and on average came in as lower level recruits. No matter how they played against Illinois, we shouldn't get pushed around like we did in the MSU game. Less pressure on Denard and we should score a lot more than 14 points. This is a game, that if we lose, will fall on the coaches. But we won't. Go Blue! Thu, Oct 27, 2011 : 7:44 p.m.
Hey Kyle, good chat today my man, enjoyed it. Let's hope our D has corrected some of those miscues and effort. I think we'll be ready for Purdue, they started out on fire last week against the Illini but fizzled the rest of the game, Offensively anyway. As long as Michigan comes ready to play, we should be fine for this game, gotta start playing well in the stretch run of this season to start a precedent for this staff, I still contend that flailing towards the 2nd half of seasons the last 3 years was a result of the previous staff and their ineptness in SOOOO many areas. This staff has demonstrated an ability, largely with the same players, to not have our D look like a sieve. Can't wait to see the future M Defenses crushing people.